We left bright and early on Saturday morning and made a quick stop in Wellington to top off my fuel tank before making our way into the canyon. 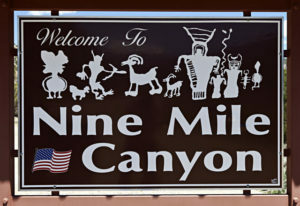 Our first stop was at the Nine Mile Ranch so that we could setup camp before starting our search. 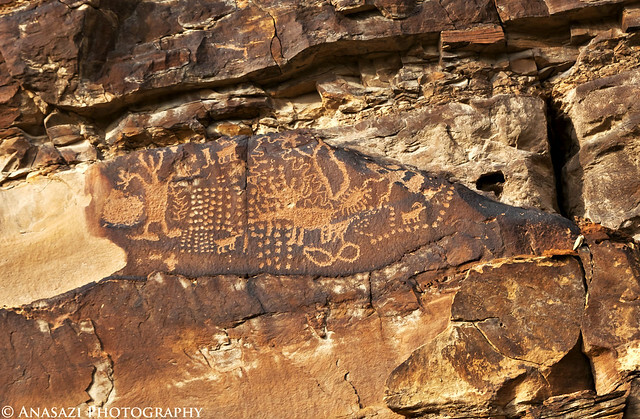 After leaving the ranch we spent the rest of Saturday and much of Sunday searching the canyon for rock art and taking many photos. 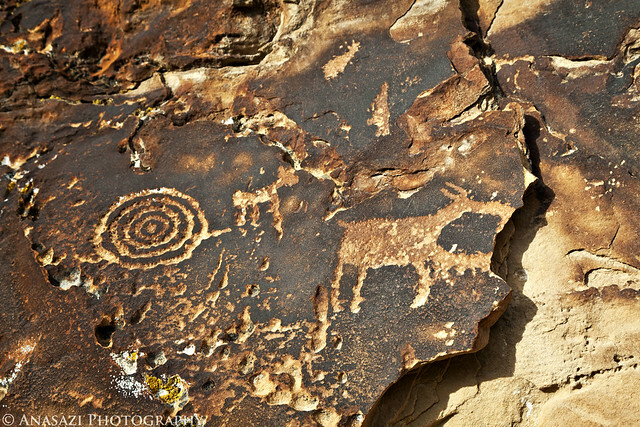 Unfortunately, many of the rock art panels are located on private property and you can only take photos from the road. 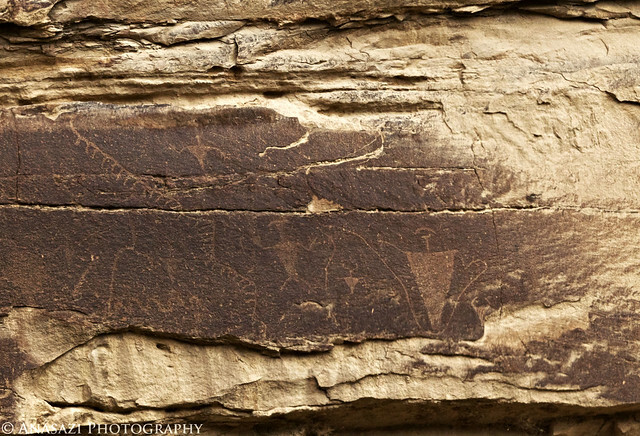 Luckily I had my 100-400mm lens with me, so I was able to get decent photos of most of the panels we found. 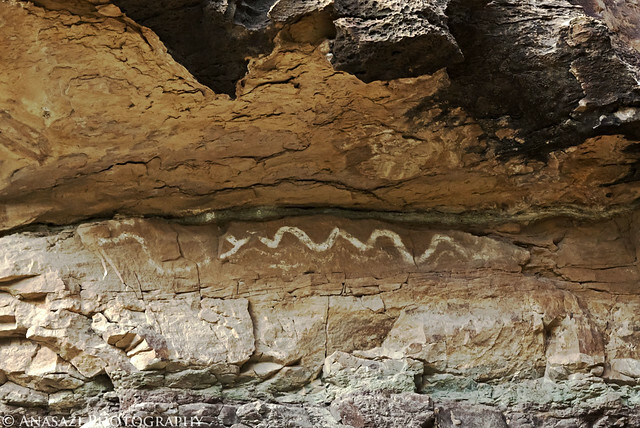 We managed to find well over 50 different rock art sites, many which contained multiple panels…and I’m sure there are a lot more that we missed. I’m looking forward to getting back and finding many more in the future. 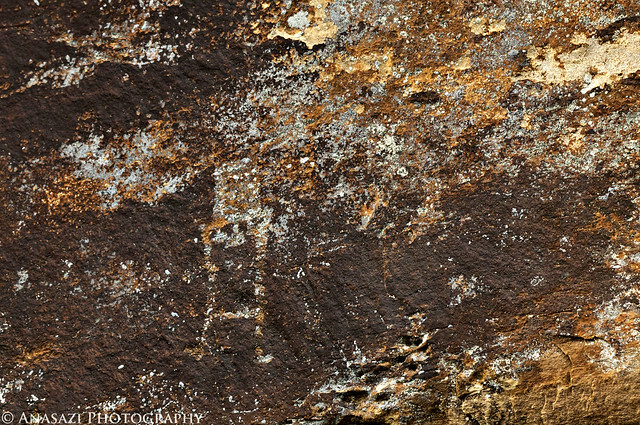 Here’s a selection of the many photos of rock art that I took this weekend. 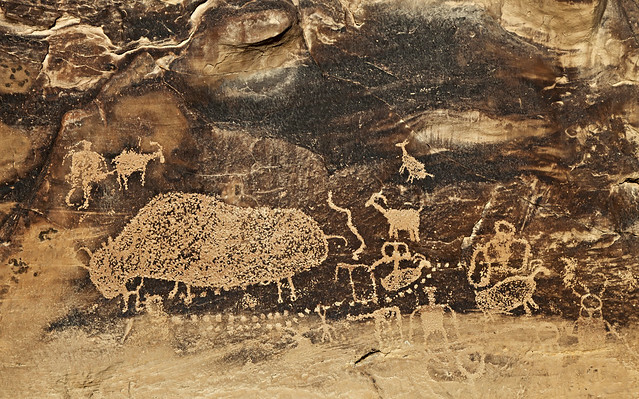 An overview of the Long-Necked Sheep Panel. 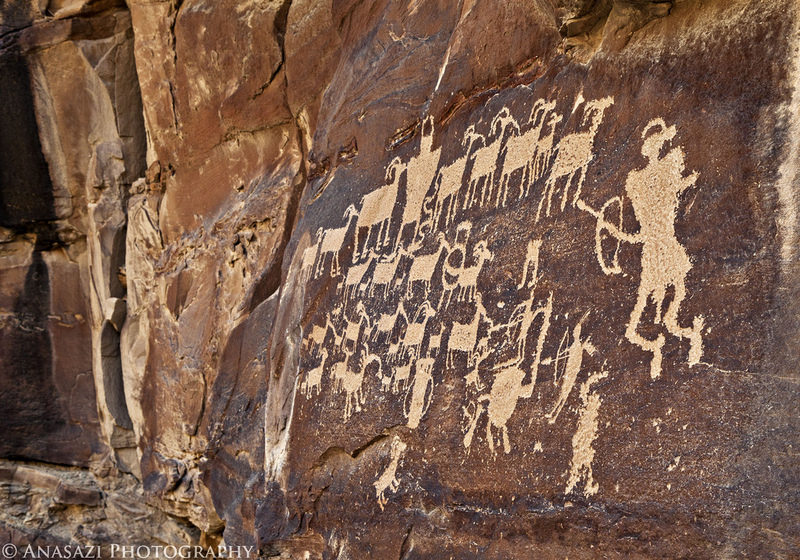 A close-up look at the Long-Necked Sheep…a very interesting petroglyph. 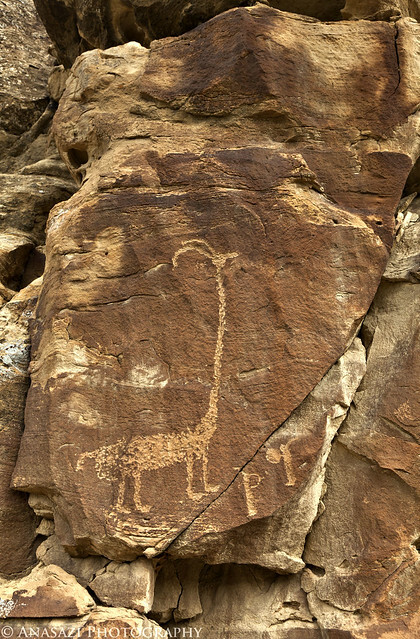 An interesting anthromorph that is part of the Long-Necked Sheep Panel. 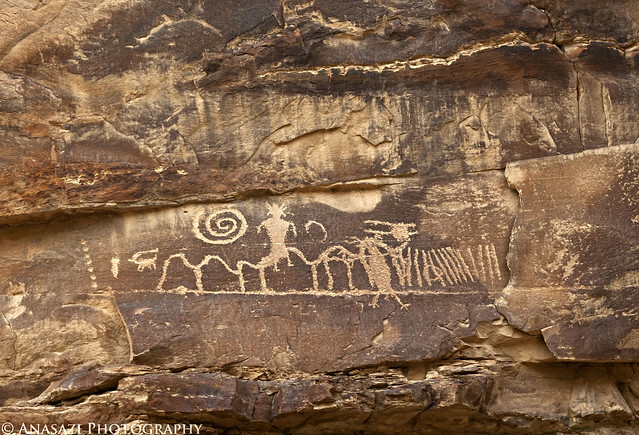 The right side of the panel with another long-necked sheep. These figures remind me of cheer leaders…they are probably holding shields. 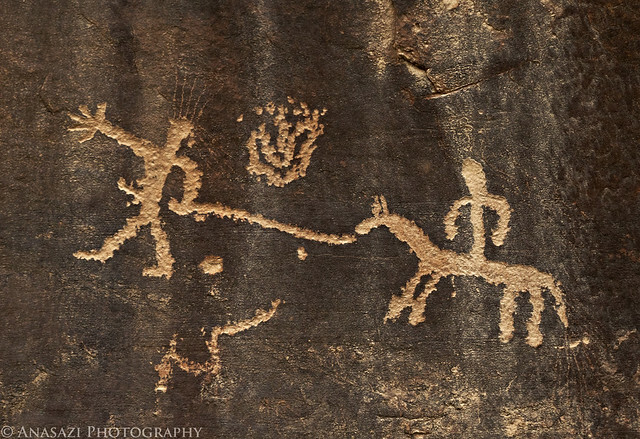 A man leading a horse with a rider. 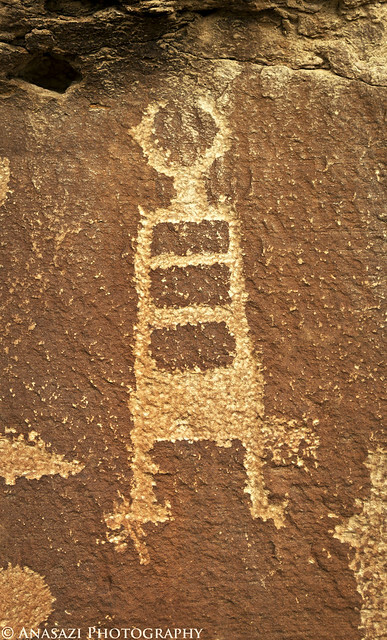 Located alone on a boulder near the balanced rock, this anthropomorph is fading away but on a colorful section of the rock. 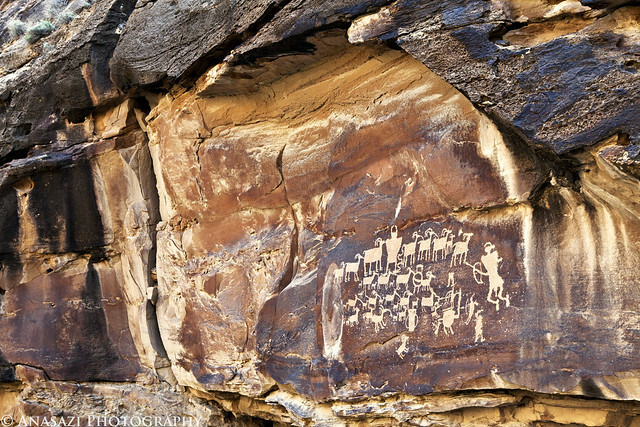 Hunting scenes are common in petroglyphs, this one has a figure with a bow and arrow in the middle. 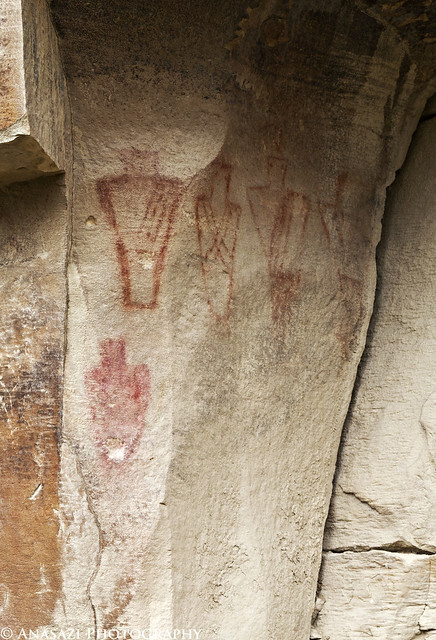 A line of decorated pictographs. 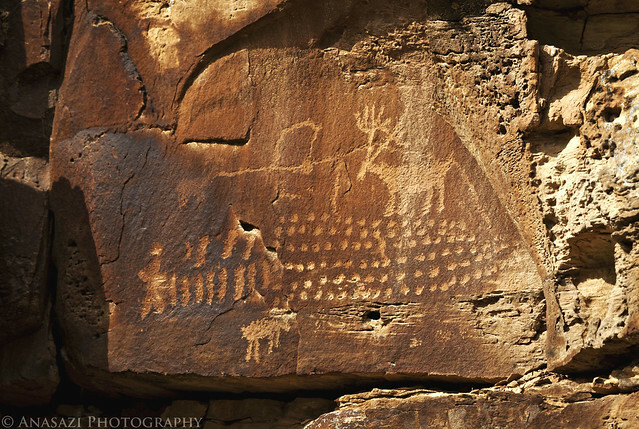 This panel has many dots with what appears to be an elk or deer pecked above. 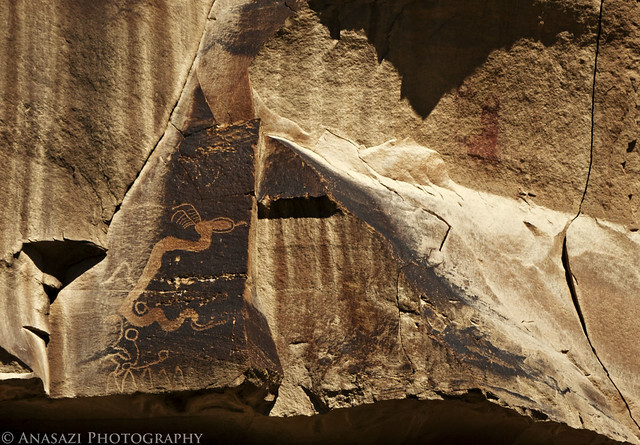 The petroglyph on the left reminds me of a head with Mickey Mouse ears on. 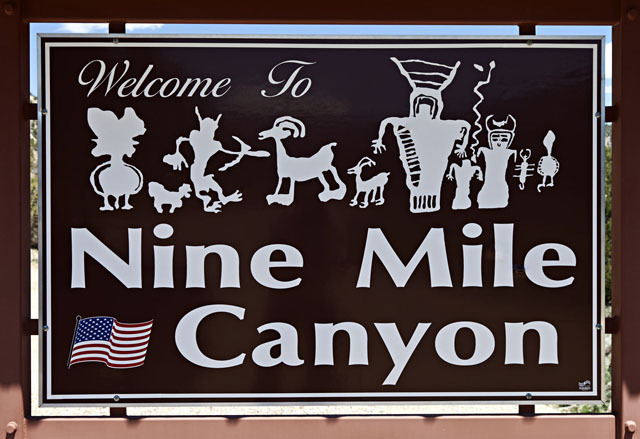 A small panel found a little ways up Daddy Canyon consisting of an anthropomorph and a few bighorn sheep. After exploring Daddy Canyon we hiked back towards Rasmussen Cave. 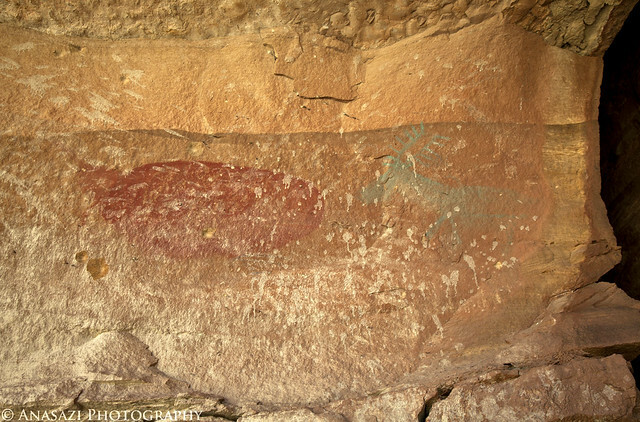 We found this petroglyph panel along the way with a very detailed elk figure under a rainbow. 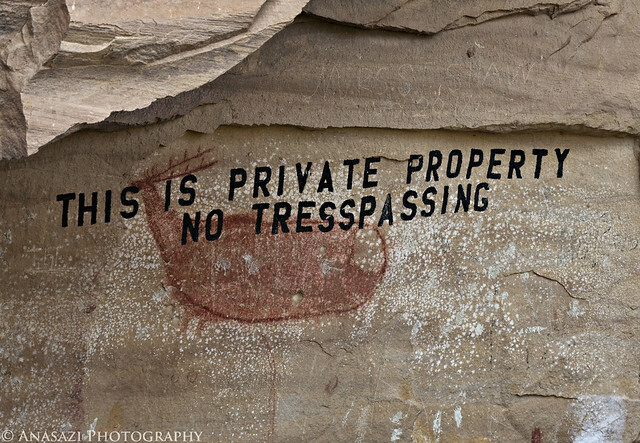 Of course, no Nine Mile Canyon photo collection is complete without a photo of this vandalized, complete with misspelling, pictograph in Rasmussen Cave. 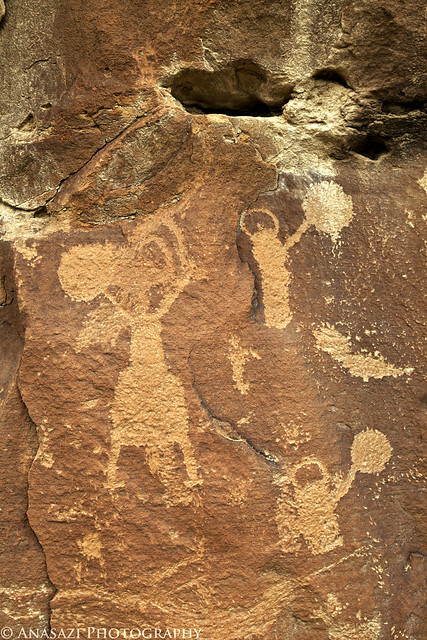 This small petroglyph panel has a figure in the middle that appears to be wearing a horned headdress and a long flowing cloak. 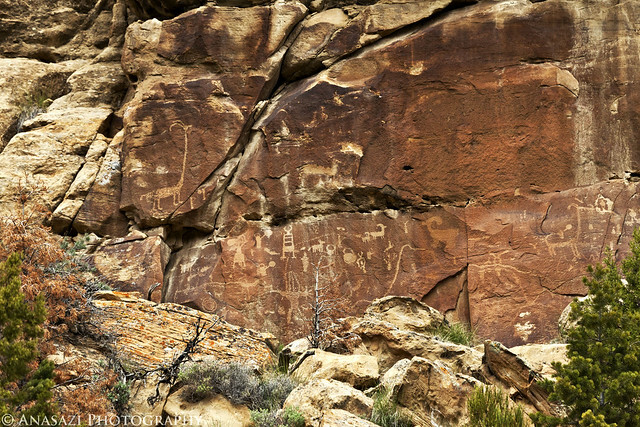 Here’s a closeup of The Great Hunt Panel, probably one of the most famous petroglyph panels found in the Nine Mile Canyon area. 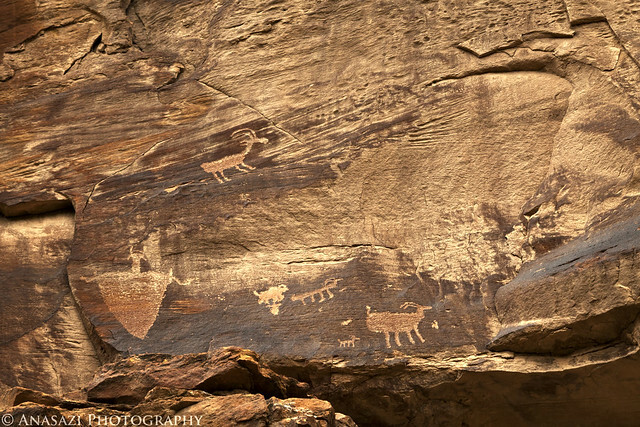 A wider view of The Great Hunt Panel. 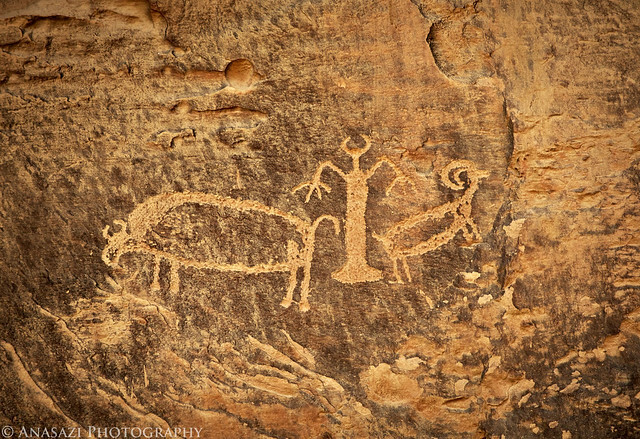 A couple of petroglyphs next to the Big Buffalo. 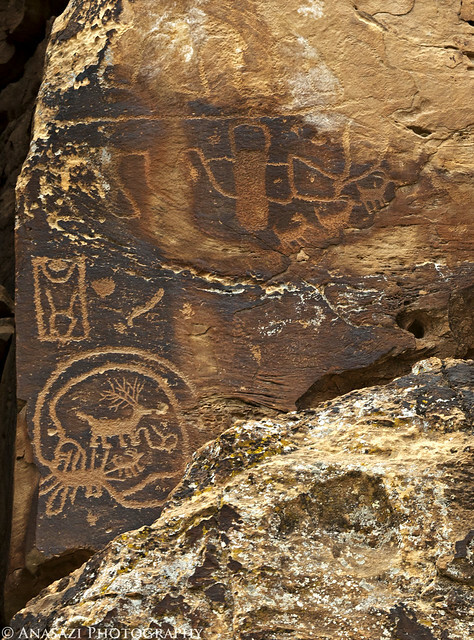 The Big Buffalo Panel at the confluence of Nine Mile Canyon and Cottonwood Canyon. The panel was glowing in the late afternoon sunlight when I was there for this photo. This panel, near The Great Hunt, features a bighorn sheep that has a large spiral tail. 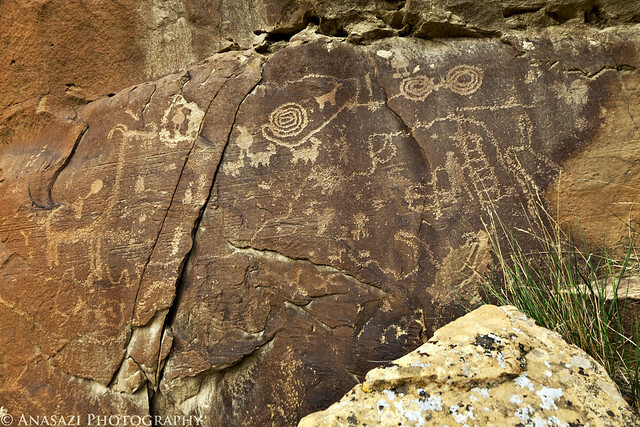 A busy panel across from the mouth of Cottonwood Canyon. 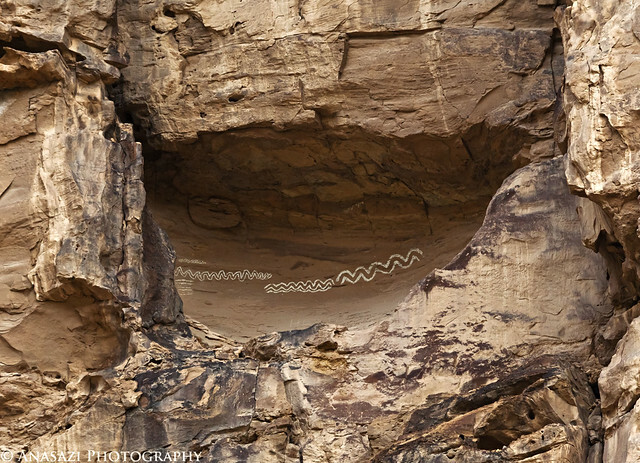 This large alcove, located high above the road, contains a few painted white snakes. 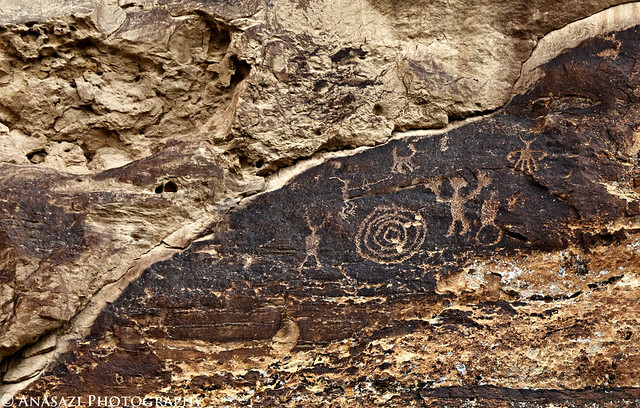 The figure in the upper right hand corner appears to have 4 legs. Amanda spotted this fading white snake along the way. A small panel with a wavy line through it. 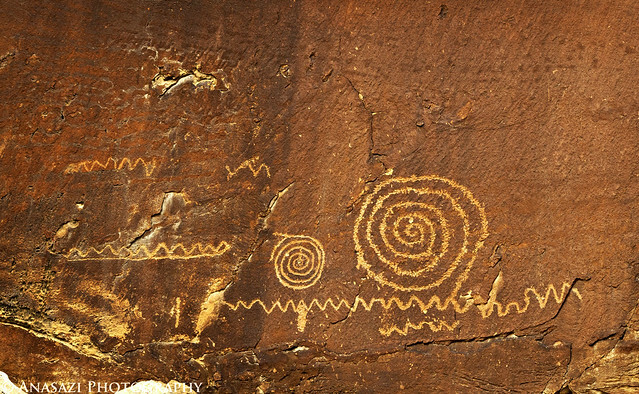 Spirals and snakes…a common theme in Nine Mile Canyon. One of my favorite horned snakes that we came across this weekend. 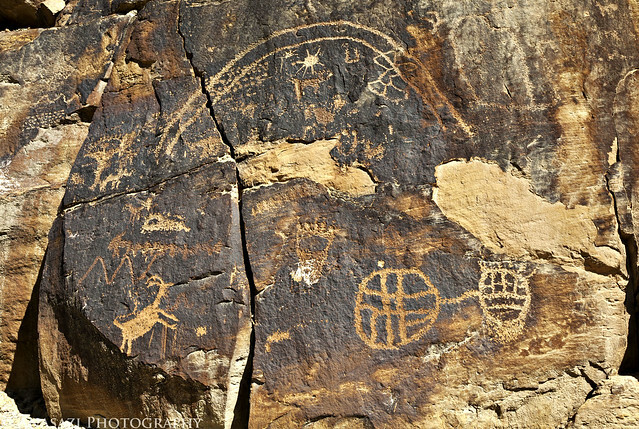 The Family Panel, another well known site in Nine Mile. 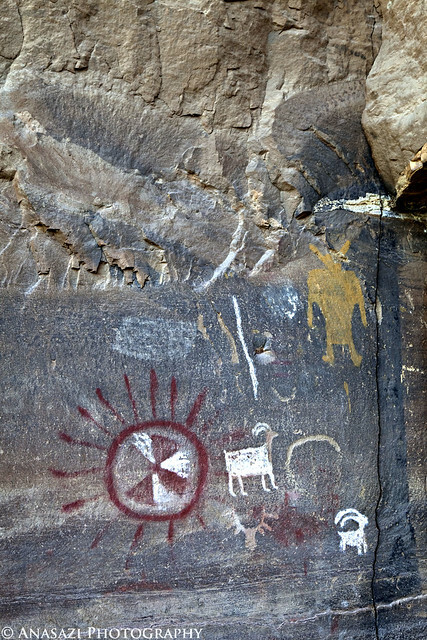 A high panel up in Devils Canyon near the remains of a granary. 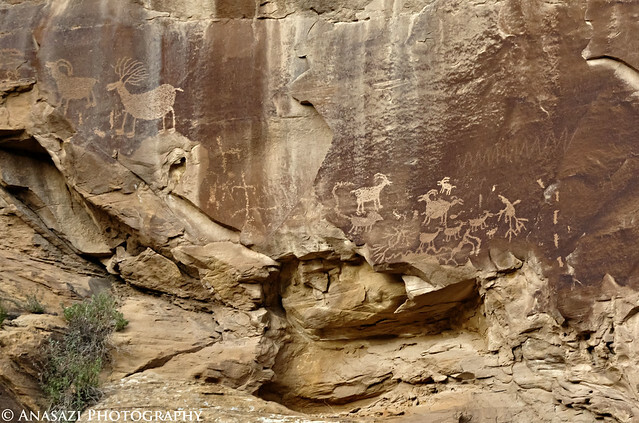 The large big horn sheep and elk on the left are pretty cool. 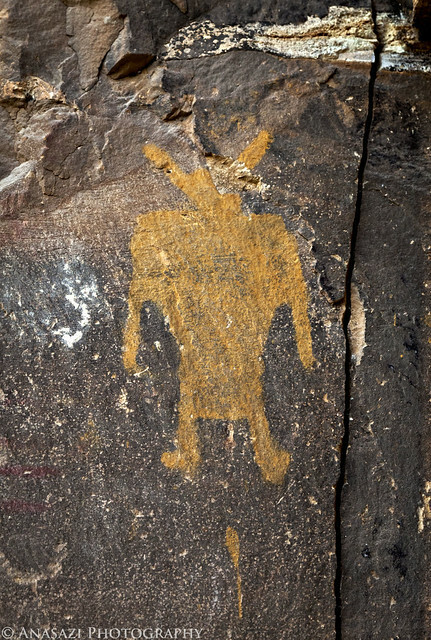 A number of anthropomorphic figures with triangle-shaped torsos. 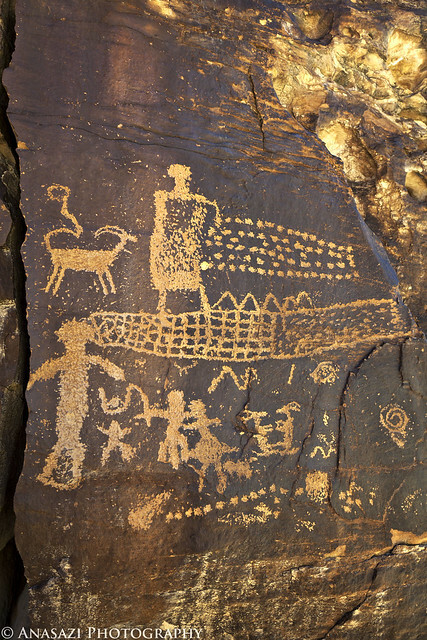 Some experts consider the large figure in this panel to be a Basketmaker figure. The last site we visited near the mouth of North Franks Canyon on Saturday before turning around and heading back to camp for a late dinner. It was starting to get pretty dark out at the last few panels we visited. 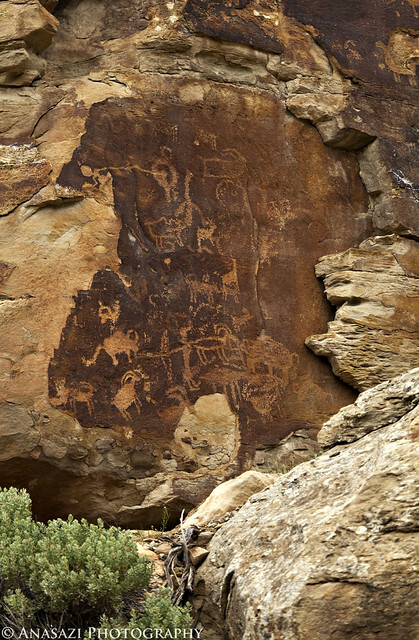 Here’s a cool panel we found on Sunday morning…look for the two bighorn sheep figures sitting and facing each other that look like they are playing patty-cake. This panel with a large rainbow-like figure is just to the left of the one pictured above. One of the more unique horned-snake figures we found all weekend. 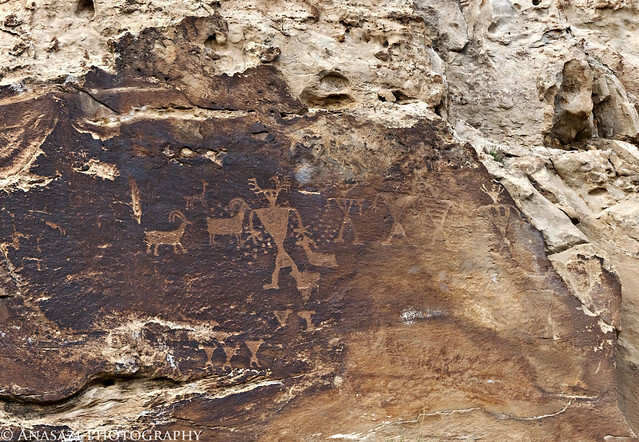 Two faint pictographs near Daddy Canyon, including what appears to be a green or blue elk on the right. 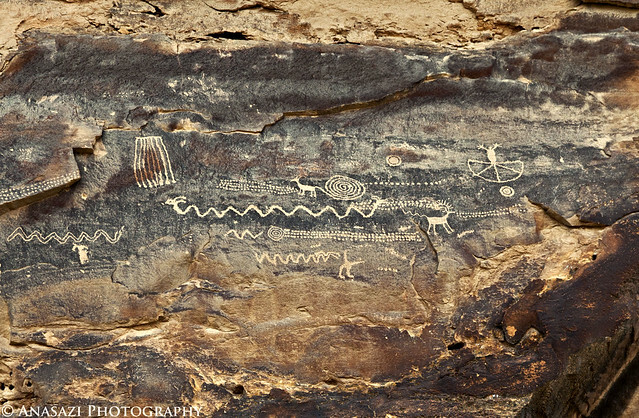 A few petroglyphs on a slab of sandstone that has fallen. 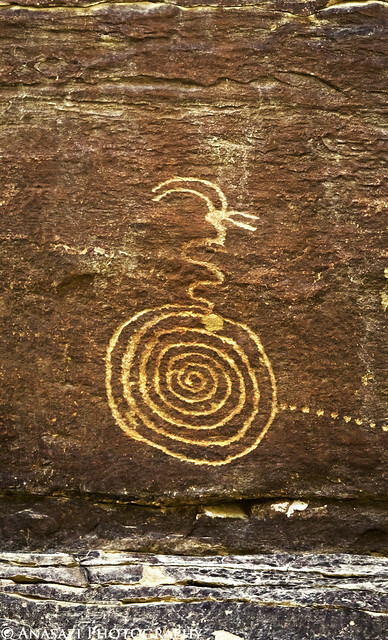 An anthropomorph pictograph in yellow. 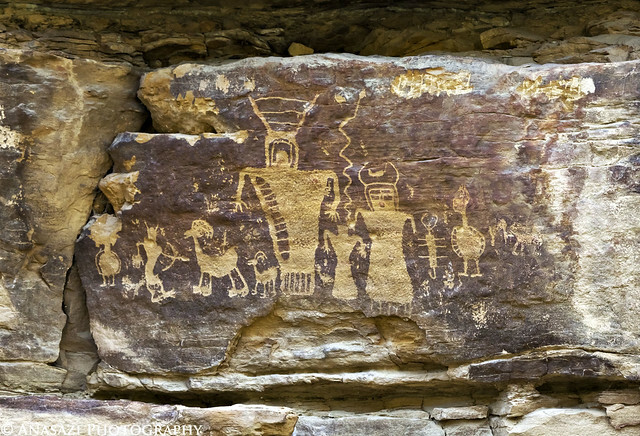 A wider view of the panel that includes the Yellow Man. 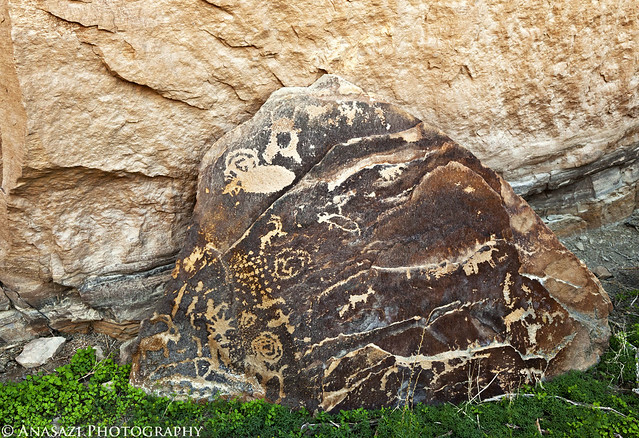 There are plenty more pictographs here and a few of the petroglyphs that are here are filled in with paint. 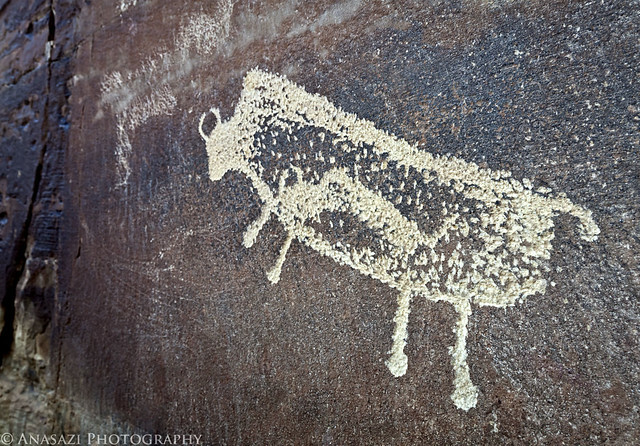 A closeup of the Pregnant Buffalo petroglyph. 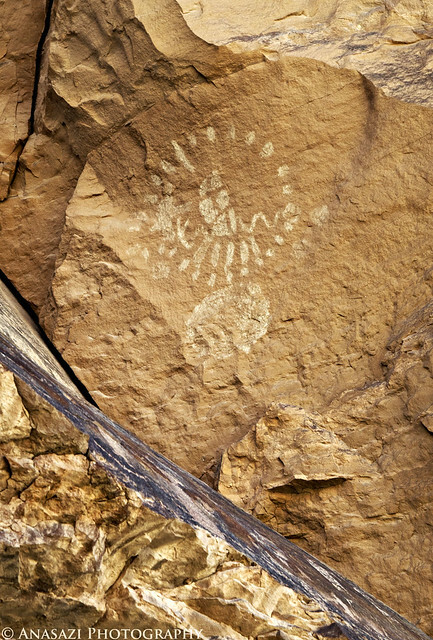 A faint white shield-like figure located high above on a canyon wall. 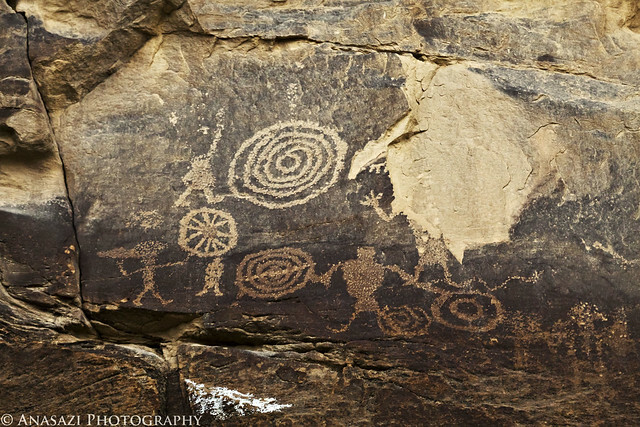 I can’t wait to head back to Nine Mile Canyon and search for some more rock art…hopefully sometime later this year! 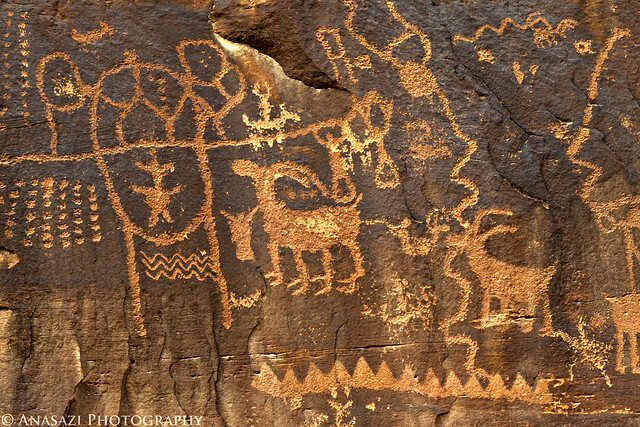 Just returned from a weekend there, at 9-Mile Ranch and at the petroglyphs and pictographs – saw many of the ones you’ve shared here. Your photos are outstanding – thanks for sharing!